Published in The Complete Works of Chikamatsu [Dai Chikamatsu zenshû]), Taishô period, 1923. 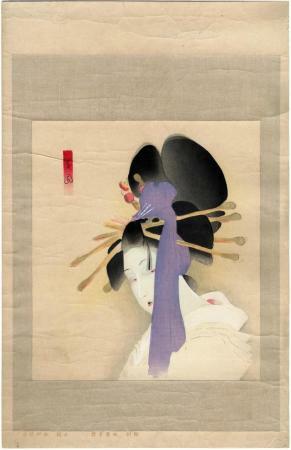 Reproduced in The Female Image; 20th Century Prints of Japanese Beauties, Hotei, Leiden, 2000, pg.97 and in The New Wave. 20th. Century Japanese prints from the Robert O. Muller Collection London 1993, the print with accompanying text is accorded a whole page to itself (Pl. 208). The carver may have been Yamagishi Kazue. The play was first staged in 1712 - probably for the puppet theater.